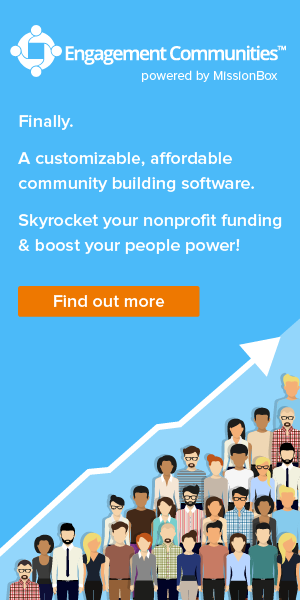 Join the nonprofit Engagement Revolution! Take a sneak peek at a few examples of constituent group homepages built by our nonprofits! MissionBox, Inc., publisher of Missionbox.com — a free education, training and funding site for nonprofits and charities around the world, announces the release of a new software package: Engagement Communities™. The private, customizable, very affordable Engagement Communities platform provides a new way for nonprofit organizations to significantly boost engagement with major donors, volunteers and board members, staff and collaborative stakeholders. MissionBox CEO Kathryn Engelhardt-Cronk says, "One of the biggest challenges nonprofits face today is to become dramatically more engaged with all constituents, while staying mission-focused and making a real social impact. Constituent engagement is the critical component to nonprofit financial sustainability and overall survival. Our hundreds of thousands of MissionBox readers have confirmed that constituent engagement is a priority and they are ready to join the Engagement Revolution!" Nonprofit stakeholder groups such as major donors, volunteers and nonprofit staff and collaborators frequently express the need to feel valued and engaged with the nonprofit they are supporting. But how do nonprofits ensure that their constituents feel involved and appreciated? Today, most nonprofits push communications at constituents by email, including attachments such as meeting minutes, newsletters, budgets, success stories and surveys. But research indicates that this approach is ineffective. Nonprofit-generated email to all nonprofit constituents have average open rates of 34 percent (in 2018), with click-through or attachment opens at 4.99 percent, meaning most of your constituents do not see your messaging. This lack of connection has serious consequences for nonprofits and charities. For instance, only 47 percent of your first-time major donors are retained after one-year, which means that in five years, just 21 of your original 1,000 donors will still be supporting your organization. Why? Because these departing major donors feel disconnected from your nonprofit mission and impact. The same is true of both general volunteers and your specialized volunteer board members. Roughly 500 of 1,000 volunteers/board members surveyed report that charities have disorganized management who do not keep them informed or engaged. More than one-third of recruited and trained nonprofit volunteers leave charities each year, at a cost to the nonprofit of several thousand dollars in recruitment and training investment for each person that departs. Internal engagement is equally important. Staff turnover in nonprofits is twice that of for-profit companies — 7 to 10 percent vs. 15 to 30 percent. 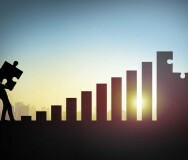 Recruiting and training new staff can cost tens of thousands of dollars per year. Plus, companies with engaged employees are 200 percent more productive, meaning staff are punctual, focused on work tasks and strong team players. While collaboration is the number one way that nonprofits can increase capacity and impact, collaborative efforts often fail to achieve positive outcomes. 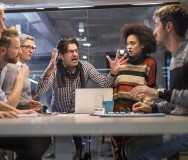 Better collaboration engagement should result in enhanced partnership outcomes by improving processes, enabling faster execution and team-wide problem solving, while opening up increased funding opportunities. Highly-engaged board members and volunteers are your best peer-to-peer fundraisers. They know your charity and they likely have a wide network of high net-worth friends, businesses and co-workers. Failure to keep volunteers informed and committed means you lose one of your best fundraising resources for major donations. A one-size-fits-all approach to communication does not allow for a variety of different messaging tailored to specific audiences. For example, major donors typically desire more information about your nonprofit and if you are spending all your time using multiple tools to send surveys, emails, and invitations, you probably don’t have the time to create different messages for that specific group of constituents. 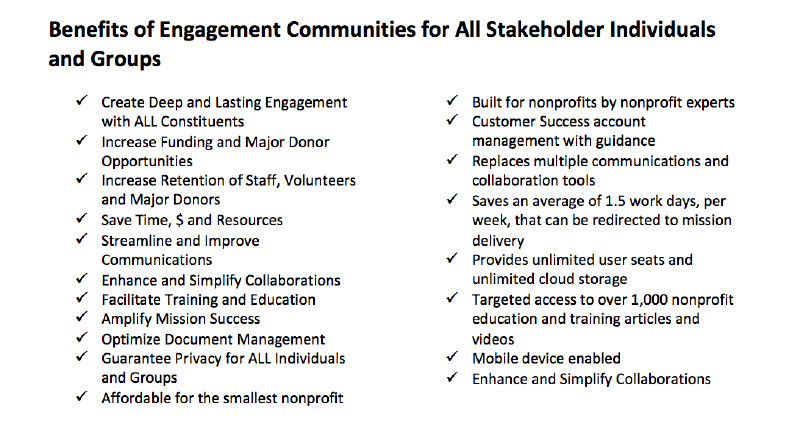 It is vital to each nonprofit’s future to get the constituent engagement process right by providing easy access to constituent communications, connection and collaboration. 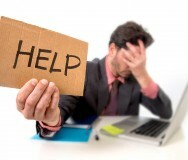 What’s the answer for YOUR nonprofit? MissionBox has launched a complete communication, connection and collaboration platform: MissionBox Engagement Communities, a one-stop solution that is built by nonprofit experts and designed exclusively for nonprofits. MissionBox Engagement Communities replicates and/or enhances all tools offered by more expensive communication platforms and costs a small fraction of usual monthly fees, with unlimited users and cloud storage. 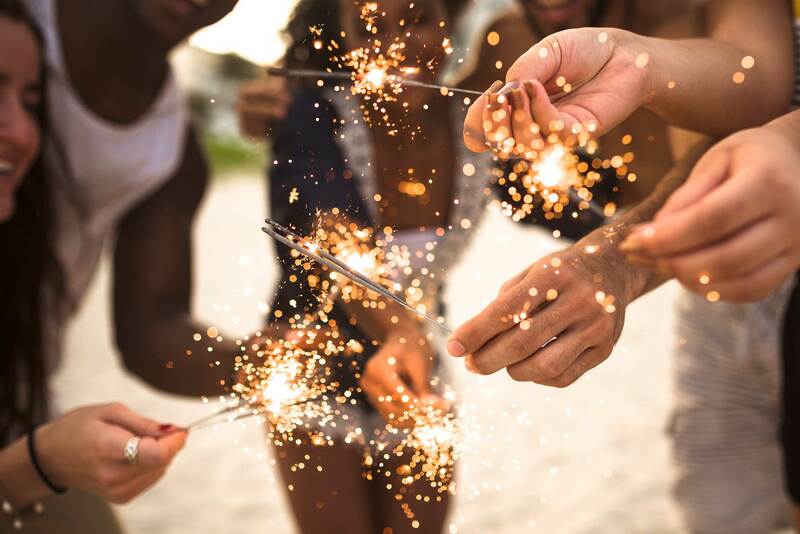 Engagement Communities acts as one secure place for volunteers, major donors, volunteers, staff and collaborators to learn about your nonprofit’s work, impact and events, and other important communications. 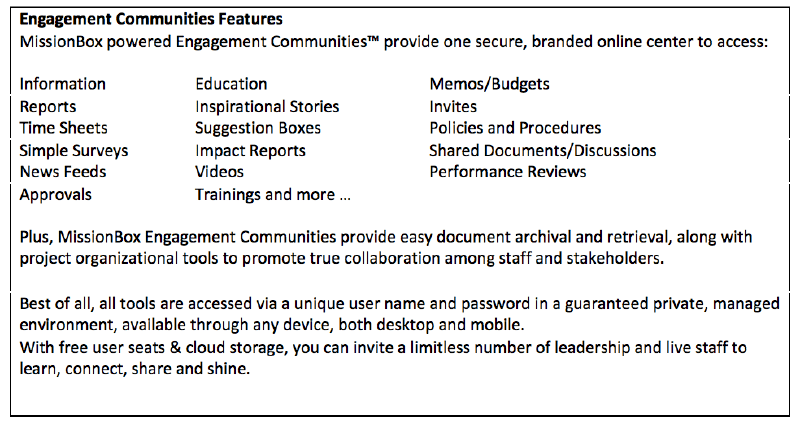 Engagement Communities can replace up to 13 different common communication and collaboration tools, as well as provide easy-to-search document storage and retrieval. The administrator of any Community designs the groups that reflect their constituent cohorts and then invites all major donors, funders, volunteers, staff and other stakeholders to their branded, one-stop home that provides the all the right information, on a private, need-to-know basis. Engagement Communities also provides a deeper level of analytics, so you'll know who has read, approved or responded to requests. Each nonprofit community has livestream video creation and storage, easily accessible for those who missed the original event. Video trainings, newsletters, impact reports, annual reports, budgets, invitations, video, education, shared documents and surveys all live in each nonprofit’s community, behind a password-protected wall for 100 percent guaranteed data privacy. And unlike "free" platforms such as Facebook Work Groups, MissionBox Communities is GDPR-compliant and MissionBox warrants to never sell or share your data. Plan a transition from the email bombardment approach you are likely using today and consider looking at MissionBox Engagement Communities, offering a highly effective way to keep your donors, volunteers and collaborators better informed and engaged. Join the Nonprofit Engagement Revolution with MissionBox Engagement Communities. Your one-stop, secure, online center for all nonprofit constituent communications and collaboration. For a free demonstration, contact dhansen@missionbox.com.